Located in the spire of One Liberty Place, Philly From the Top is the highest publicly accessible point in Philadelphia. It is located on the 57th floor of said building, which has a spire that reaches 975 feet. The experience is very memorable, even before you reach the top. The deck is entered from the Shops at Liberty Place, a mall located in the bottom two floors of the complex. First, you walk through a vibrantly bright line, where icons of Philadelphia past and present are shown on the walls. After you walk up the stairs and get your tickets, you come across two large feet in the center of a small room where the sound of thunder and rain can be heard overhead. That’ll make sense in a minute. After going through security and whatnot, you’ll get in the elevator, where you will watch a small film about how great this city is, and then you will arrive on the 57th floor. As soon as you walk out, you are greeted by a sculpture of the head of Benjamin Franklin. One Liberty Place itself is notable for being the first skyscraper in Philadelphia to pass City Hall in height. Upon City Hall’s completion in 1901, not only was it the tallest building in the world, but a “gentlemen’s agreement” was formed to prevent any building in Philadelphia from passing the statue of William Penn on top. After a major controversy, construction on Liberty Place began in the mid-1980s. It was completed in 1987, ending William Penn’s 86 year reign of the skyline. It was followed shortly after by Two Liberty Place (848 feet), Mellon Bank Center (792 feet), Three Logan Square (739 feet), the Independence Blue Cross Tower (625), and the twin towers of Commerce Square (572 each). 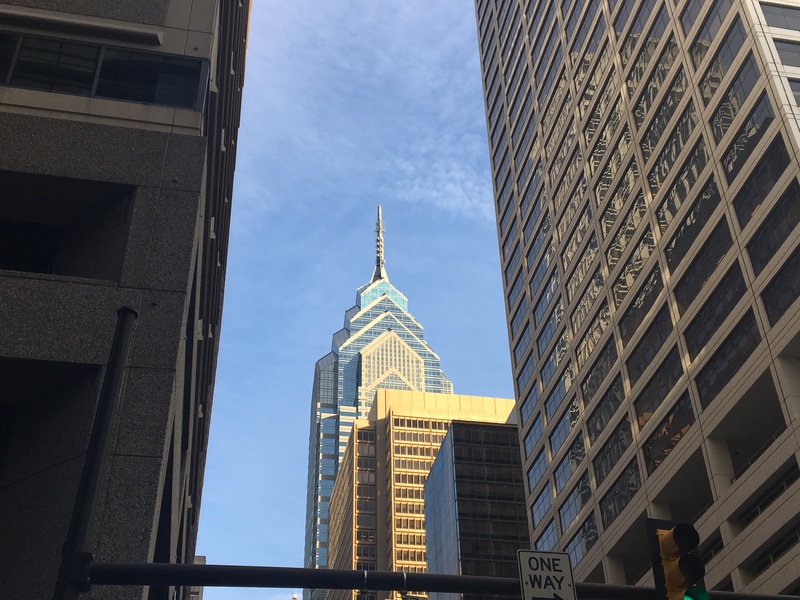 Skyscrapers built afterwards include the Comcast Center (975 feet), FMC Tower (736 feet), and the under-construction W Hotel (582 feet), and the Comcast Technology Center (1,121 feet), as well as long term projects in University City. The views are the real highlight. To the north (where you enter), the Comcast Center is the dominant feature, the only building in Philadelphia taller than One Liberty Place. Part of the Benjamin Franklin Parkway can be seen, including the Barnes Foundation. From up here, the city seems to stretch forever to the north, and Temple University is a defining feature that stands out from the rest. The spires of churches also have a large presence in the north. Beyond the expanse of the city is Bryn Athyn, with its gothic cathedral. 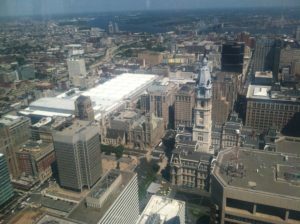 To the East, City Hall can be seen, with William Penn’s backed turned to the only things that exceed his height. The Pennsylvania Convention Center is absolutely massive, and it shows from up here. The magnificent Masonic Temple and the PSFS Building are also visible. From here, you can see the Camden Waterfront and New Jersey beyond. To the south, you’ll immediately notice the sports complex and its three stadiums; Citizens Bank Park, Lincoln Financial Field, and the Wells Fargo Center. Aside from that, it has the same expanse of rowhouses and churches that the north has. The Italian Market is also down there, but it is not visible because of Two Liberty Place. Rittenhouse Square looks great from up there, even in the dead of winter. Further off in the distance is Philadelphia International Airport, where planes can be seen taking off and landing. On a clear day, Wilmington, Delaware, the largest city in the state, is visible in the distance. To the west, the ever growing University City is a short distance. The University of Pennsylvania can be seen easily with Franklin Field and the Penn Museum on campus. If you look due west, you’ll see the Market Frankford Line moving from there. Trains also visibly move in and out of 30th Street Station. Off in the distance are St Joseph’s University and the St Charles Borromeo Seminary. There are touchscreens around the deck to give you a closer look at the view, and they point out landmarks, both famous and obscure. There is audio in the background that plays sounds relevant to the part of the city on view. From the top, it’s fun to look down and watch cars go by, especially as you compare them to how it seems down on the street. At night, the lights of Philadelphia are seen from all directions. Admission is $14 for adults and $9 for children. Several different discounts are available, including a family pack and a ticket for two visits in two days. It is also included in the Philadelphia CityPASS. Expect long lines and huge crowds if you decide to go in the summer.